Gypsy is a sweetie. 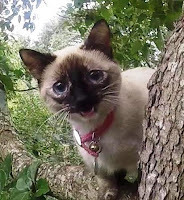 She is an adorable 9-month old Siamese munchkin who climbed a tree in her front yard and did not know how to come down. 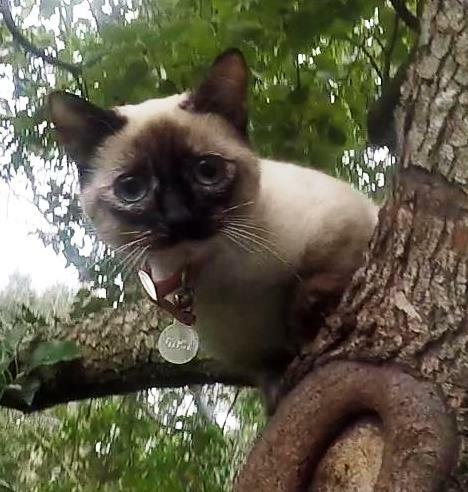 She had climbed a tree twice before, but her family managed to get her down both times. This time, however, she was over 20 feet high, and they were unable to reach her. She had been in the tree only three hours, but it was cold outside and rain was due to arrive very soon. Fortunately, she was only a few blocks away from my house, so I was able to get there very quickly. Gypsy was a perfect rescue. She was very comfortable with me and very cooperative. While she climbed one branch higher before I reached her, she was still within comfortable reach. She let me pet her while I prepared the bag for her descent. All I had to do was pick her up to put her in my lap for a moment and then gently place her in the bag. She handled it all without complaint or struggle. 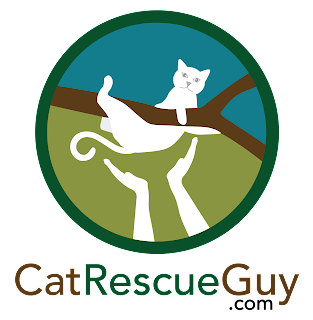 Gypsy was a model rescue. I wish they were all this easy and enjoyable. It was a joy to bring her back down to her waiting family as they obviously cared about her very much.